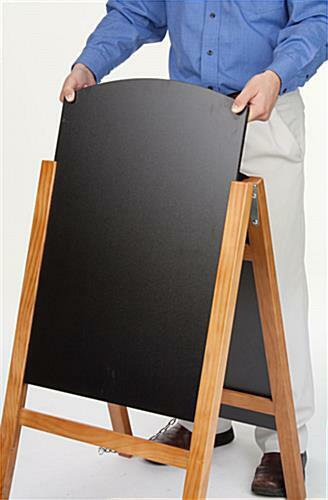 Common Size: 18" x 26"
Consist of (2) 18" x 26" blackboards for displaying message back-to-back. Hardwood construction with teak finish ideal for use in any stores or eatery. 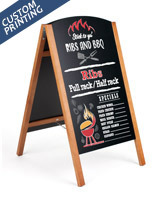 Black board slide-in and out from the wood frame for quick and easy message changes. 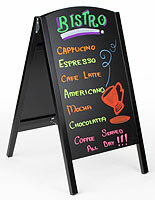 Textured blackboard is compatible with traditional stick chalk, liquid chalk, or wet-erase neon pens. 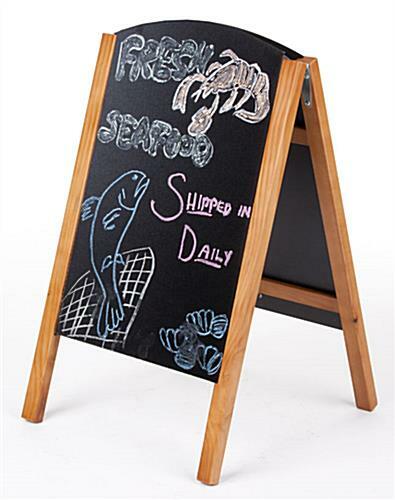 This wooden a-frame, easel chalkboard is great for displaying everyday specials, ongoing promotions and new menus in any business settings. 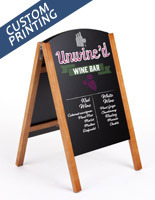 Besides using the blackboard for commercial advertising, this sidewalk sign also makes an ideal educational tool in schools, art studios or daycare centers. 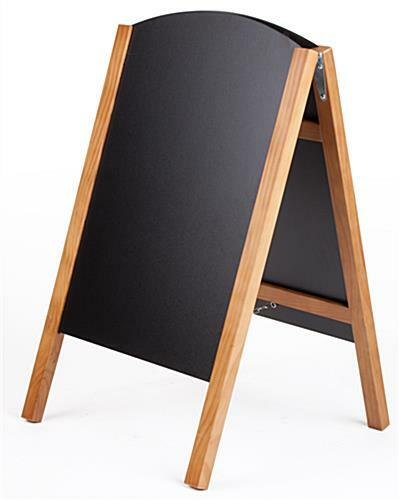 This write-on blackboard, wooden easel chalkboard has a wood frame with a teak finish that blends in perfectly to any environment. Each unit features two 18" x 26" blackboards. 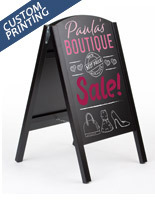 An a-frame board, easel chalkboard that is double-sided maximizes your advertising capabilities. Passersby coming from both directions will be enticed by the displayed advertisement. 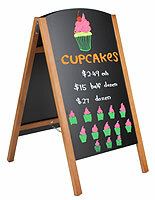 This easel chalkboard, like menu boards and sidewalk signs, is also an ideal way to make quick and easy changes. 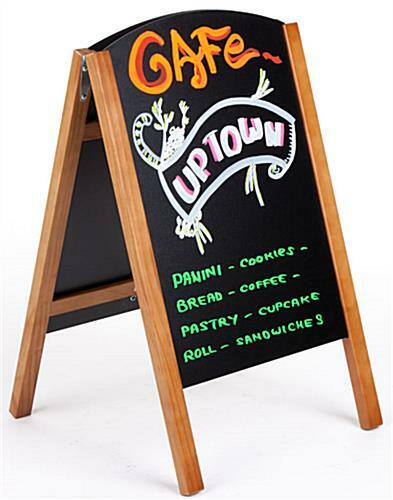 Both the blackboards can be easily slide-in and out from the wooden frame, which enables users to create their advertisement on the table. 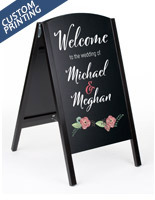 Advertisers can use regular stick chalk, wet-erase neon pens or liquid chalk markers (sold separately) on this easel chalkboard that has a textured board. The space is large enough to create customized message and advertisement. 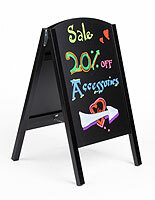 Messages written on this a-frame easel chalkboard that features two blackboards can be updated in matter of moments with a damp cloth or magic eraser. A blackboard, like the one seen here, is great for places that update their advertisements and messages frequently. The wet-erase or liquid chalk markers may be harder to clean. Therefore, the purchase of this a-frame blackboard will include a magic eraser that helps get the message off the board. 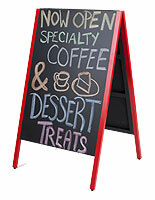 This menu board is often used within a variety of indoor locations, such as restaurants, cafes, bakeries, bars and retail stores. 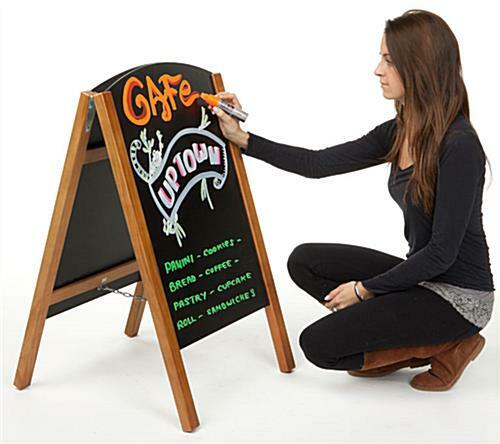 The fact that this a-frame blackboard is made from wood restricts its use to indoor spaces. However, businesses can also place them outside but under fair weather conditions. 21.3" x 35.0" x 22.3"
21.0" x 35.5" x 2.8"
Looks cute on our brick sidewalk. Nice large board. Slightly difficult to move when folded up, but no worries. It's heavy enough that a strong gust of wind won't "walk" it down the block! Washes off easily; we use traditional chalk. Looks great, Wear! Thanks for the feedback and for sharing the photo!